In The Heart of Central Pacific. 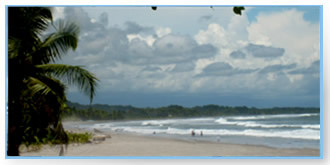 The Central Pacific runs from Jaco Beach to Manuel Antonio to the South. This area is known as Costa Rica`s Gold Coast. There is no denying that construction is booming on the Central Pacific. The Costa Rican Construction Chamber reports a 136% increase last year in building in the province of Puntarenas over 2006. The transforming effects of these developments have already begun, and not just in the skyline. There is a newly minted Chamber of Commerce, which is working to promote beach cleanup, security and improvements in roads. Additionally, a host of interior designers, various stores, restaurants, super markets, and other services are popping up in the area as well. There is also a wide selection of activities and tours in the Central Pacific that is available which includes: canopy tours, hiking in Carara & Manuel Antonio national parks, whitewater rafting at Naranjo River, horseback riding, sea kayaking, snorkeling, surfing, sailing and fishing, golfing, boating. About 15 minutes south of Jaco Beach, is the little coastal village of Esterillos Oeste, right in the middle of the Central Pacific boom. 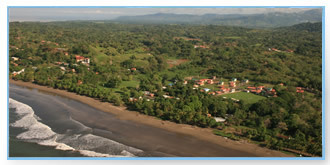 Esterillos Oeste has a population of about 300 people. It has a school, a health clinic, restaurants and other small businesses. Esterillos beach is named after its numerous estuaries (Esterillos is Spanish for "little estuaries"). Because of its length, it is divided into two areas: Esterillos Este (east) and Esterillos Oeste (west). Both beaches are ideal for enjoying the ocean, though the waves are strong and constant making it an ideal surfing beach. There is something else that is very special about Esterillos Oeste, it's one of the few areas from Jaco Beach to Quepos that has gently rolling hills right next to the beach. 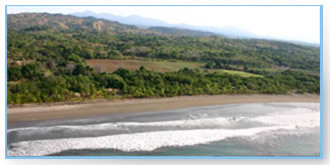 Most of the other terrain between Jaco Beach and Quepos is flat and use to be used to grow rice. The hills in Esterillos Oeste provide dramatic views of the ocean and mountains. Esterillos Oeste seems a world away from the cranes and dump trucks that are up the road in Jaco Beach. Instead of that you have men and women bartering for fish from the small fishing boats that are scattered along the beach. 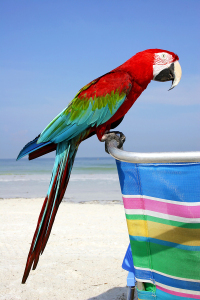 Scarlet macaws fly overhead and roast in allemande trees that are on the beach. Esterillos Oeste has a long, wide surf-swept beach that is a great surfing beach, but also is one of the only places in the Central Pacific that has tide pools which makes it a great family beach. When the tide goes out the tide pools are exposed making it an ideal place for kids to play safely in the water. In fact sometimes you see whole families playing in the pools. The beach in Esterillos Oeste is one of the nicest beaches in Costa Rica. It extends for miles and it's filled with nature. You can walk for miles and sometimes not see anything or anybody, but raw nature.